I really do apologize for all my long absences on my blog. I think about my blog friends and especially am grateful for those that have sent me greetings and well wishes and more. I'm entering a "rehab type" major surgery next month and someday Humpty Dumpty Nanette will be put together again. I hope. 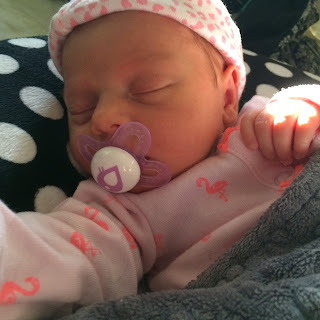 My 3rd granddaughter was born 2 weeks ago. Claire is the first baby for daughter Tracey and her husband Eliot. I probably won't get to hold her for a couple months since they live in Tulsa. But mommy is great to send me daily pictures. She's adorable. Claire weighed about 5 1/2 pounds but is gaining rapidly. Not as rapidly as Tracey's cat Max! We are really grateful for this new addition to our family. Now we have 3 granddaughters and couldn't be happier with our all girl trend (well, except Mason). 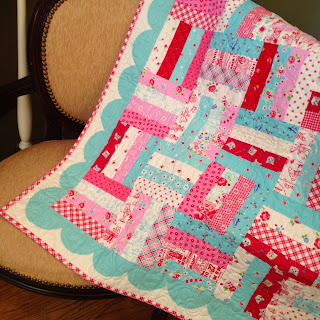 I used the scalloped edge from Sunrise Studio. The aqua and red coordinate with Pam's fabric colors. I made a tiny error on a bit of it so it isn't "perfect" but it turned out so well and I'm in love with the edge. 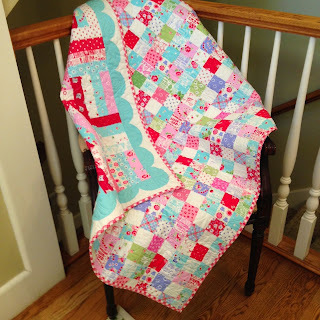 I chose a quilt design straight out of Red Pepper Quilts inspiration by Rita. I love Rita's quilts. 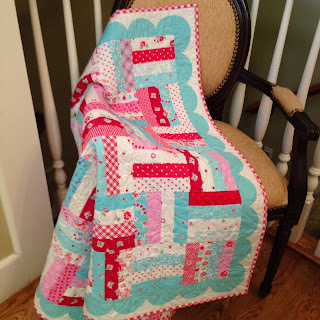 Her quilts are simple and the fabric is always set to star. She often gives simple directions on her blog, too. 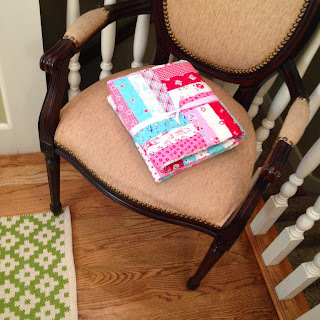 I used the patchwork yardage (aka cheater cloth) design from Pam Kitty Garden for the back. My handy dandy machine quilter Wendy from Eagle Mountain Quilting, made sure it was squared perfelctly before embellishing it with a great garden floral/leaf design. It turned out exactly as I'd hoped. Baby Claire is here and adorable baby quilt done. I love finishing a project and standing back to admire. I'm sure Claire will love it.